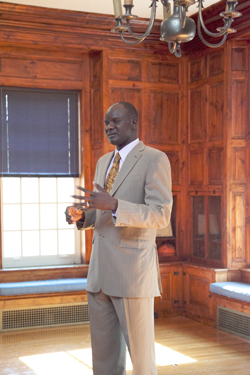 International humanitarian and author John Bul Dau visited The Williston Northampton School on Tuesday, November 8. Mr. Dau addressed the entire student body in the Athletic Center in the morning. Parents and alumni were invited to view his presentation via a live webcast. Following his presentation, Mr. Dau spent time in Williston’s classrooms, meeting with students and participating in class discussions. In preparation for his visit, many students, including those taking World Civilizations and all Middle School students, read his memoir, God Grew Tired of Us. The book chronicles Dau’s journey as one of the “Lost Boys of Sudan.” He traveled over 1,000 miles by foot, subsisted in the desert, and finally arrived in the United States as a refugee. He has since attended Syracuse University and created the American Care for Sudan Foundation, which has raised more than $170,000 to build a clinic in southern Sudan. Dau’s visit to Williston, which is supported by a gift from the family of Sarah Wattles Perry ’77, provides an opportunity for the entire school community to reflect on the questions and challenges of global citizenship. To view Mr. Dau’s presentation, please visit the Williston Northampton School’s YouTube channel or view the video on the school’s site. Pictures are available on Flickr. Head of School Bob Hill also reflects on Mr. Dau’s visit on his blog, The Head’s Perspective.